Thank you for inviting me to make a short contribution at this PIC Ambassadors Conference organized by this very aptly named University, the Asia Pacific University (APU) or Ritsumeikan, in Beppu, Oita. Naturally the area of focus, Climate Change, is critical, and presently thought provoking to the islands and the island communities in our region. Indeed, the topic is critical to the point that its effects and consequences send chills down many small island communities’ spines. Yes, the fear of the non continuing survival for those communities that have only known nowhere else, but, where they are, and know now, is an issue beyond their comprehension and horizon. Many scientists the world over, have through various regional and international FORAS testified convincingly about climate change and its consequences to human and other habitats of affected island communities. It is now action time to curb climate change or to save the habitat, including human dwellers in affected areas. There are not too many international sympathisers or helpers, but to secure and sustain international understanding and willingness to help, we the Pacific Islands Countries (PICs) ourselves, must demonstrate that it is firstly us who are willing to help ourselves. Towards that goal therefore, we must show that we are together and coordinated in addressing the challenge of Climate Change. In the eyes of many in Papua New Guinea, including our Government we content that we must deal with the issue on a common stage and platform to be heard, loud and clear. So our challenge is to have a “common call” upon our best diplomatic and other networks and energies, and; to have a common platform from among all our voices of such diversity within our countries and islands, in terms of other development challenges. We must be seen to be acting collectively, and in one voice, in the “Pacific Way” to be understood and supported. This has been the message being echoed by our leaders, the latest being by the Prime Minister of Samoa two weeks ago in Port Moresby, Papua New Guinea when he said, “the PIC must take a collective stand” on Climate Change, when addressing the ACP Summit of Leaders. In our Region, we in PNG believe that, the common call and platform upon which to undertake our case must be the one that our fore fathers, founded. That is the South Pacific FORUM (SPF), now renamed the PACIFIC ISLANDS FORUM (PIF). Papua New Guinea, of course, joined the PIF at Independence in 1975. Since then the PIF, together with its specialized Agencies, remains for us, the “Premier Regional Organization”, and which we continue to cherish, and support as a strong Member, with founding countries like Samoa, Fiji, and Tonga, and now, new nation states, our friends from Micronesia, like FSM, Marshalls and Palau. Currently, the PALM Process of cooperation with Japan, stands out as a specific Platform under which our PIF leaders can engage with the Prime Minister of Japan, on equal footing, going forward on various issues, including environment degradation natural disasters and Climate Change. Recent decisions at the FORUM, through the MAJURO DECLARATION of 2013 and the PALM7 Declaration of Fukushima last year are good standard bearers for the Pacific Nations to use to make the region’s case. For PNG there can be no other politically cohesive and collective body like the PIF that is credentialed by its democratically elected Governments of our countries to engage freely among ourselves and with the rest of the world, including Japan on issues such as Climate Change. The Fiji-based Forum Secretariat, despite its many challenges, is the sole administrative and implementationary arm of PIF, headed by a Secretary General, who is appointed by the Leaders of the FORUM. So, apart from regional trade, investment and fisheries, environment and climate change issues must also have the common call and platform of the PIF and its sister agency, the SPREP. We must collectively carry and present the PIF Decisions to Japan, and the global community, especially those “DIALOGUE PARTNERS” of the FORUM. At the same time our own respective Foreign Policies, must also advocate “Climate Change” as a key national interest of high priority. It is therefore incumbent upon us, the PICs to organize, act collectively, where necessary through the Forum SECRETARIAT and bilaterally, and speak in one voice, to properly access PALM support opportunities it offers, including benefitting from funding pledges already made by Prime Minister Shinzo Abe. Of essence is that, through solidarity among PICs on issues most critical to us, like climate change, we can do a lot more together, than pursuing our regional concerns as individual countries or Governments. Japan is a good, trustworthy friend and partner for PICs generally. Indeed, we in PNG value Japan as a sincere, generous and strategic partner, both for PNG, and the PIC Region. On Japan’s part, it has to get more aggressive, pro-active and maintain its “comparative advantage” in the region, and speak, promote and fund climate change concerns in the PICs. Japan must understand PICs, our peoples, our environment, our strengths and weaknesses and needs; and engage with our institutions a lot more directly than relying too much on unproven, “desk top” Japanese experts on PIC matters. In our view, Japan’s learning institutions and NPOs too have a duty to be positive agents for solidarity among PICs, so that Japan’s engagement is clear, decisive and mutually beneficial. Specifically, Japan should now, in the absence of its popular PEC Fund under PALMs 5 and 6, undertake and fund studies, either through JICA or otherwise, on the impact of Climate Change on critically affected PIC countries, with a view to recommending scenarios or options available to those communities, including possible cross migration or re-settlement in other willing PICs in the most fatal situations. 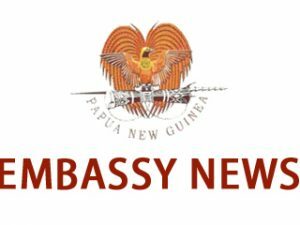 Ladies and Gentlemen, In conclusion, Papua New Guinea, for its part continues to be willing and ready to support all actions taken regionally, globally or by friendly countries, like Japan. If we in the Pacific do not have a common “call” and stand on a common platform to carry forward the region’s case, in meeting the challenge of “Climate Change”, then we are doing ourselves a disservice.